After demonetization, Prime Minister Narendra Modi’s next audacious plan is to give away land to 300 million landless Indians by 2018. NEW DELHI: After demonetization, Prime Minister Narendra Modi’s next audacious plan is to give away land to 300 million landless Indians by 2018. “ The rich will be `encouraged’ to donate their land to poor. But, the government’s top priority is to identify and distribute unused land that belongs to government departments and institutions,” said a top source in the Prime Minister’s Office. (PMO). The proposal to replicate Acharya Vinoba Bhave’s ‘Bhoodan Movement’ signals Modi’s political shift from urban to rural. In 1951, Bhave travelled across India persuading wealthy zamindars to donate a percentage of their land to the landless. Bhoodan.2 could be the PM’s game-changer when people queue outside polling stations to cast their votes in April-May 2019. Sources told The Sunday Standard that Modi has been mulling the issue for almost a year. They said.,“ After several rounds of the meeting, the prime minister directed a high-level committee be set up last year. It was put in place on June 17, 2016, and is expected to submit its report by June 16 this year.” The government is in the process of identifying unused government land. The move is likely to face stiff opposition from states, which will see it as a violation of their federal rights. 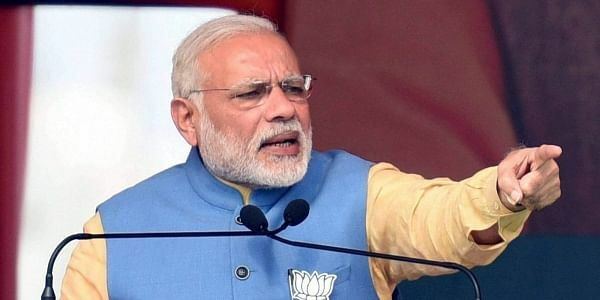 Top PMO sources said Modi had raised questions over how and why just 10 percent of the population controls 55 percent of the country’s cultivable land while 60 per cent population owns only 5 percent. The proposal being examined by the committee includes mapping land holdings by various Central government departments. Modi Sarkar will work in close coordination with the states to put the unused land to better use, since the matter falls under the state list of the constitution; the power to enact laws relating to land vests with the states and not Parliament. Bhoodaan.2 will be supplemented by other proposals on land pooling, land ceiling and land leasing. State governments, especially BJP-led, will be encouraged to identify big land holdings by Gram Panchayats for the purpose. A PMO note reveals government plans to integrate the database of all land holdings across the country through the computerization of land registration records and establishing connectivity between registrars, tehsils and revenue offices with digitization of maps, which define land ownership. According to the note, the government has completed 60 per cent geospatial mapping of land in Andhra Pradesh and around 90 per cent in Chhattisgarh. In 33 districts of BJP-ruled Gujarat, computerization of 80 per cent of land records is complete. In Rajasthan, the government has chosen about a dozen districts where computerization of land records is complete and the geospatial task has been put in the motion. Sources also said once the proposal is mooted, they will ensure connectivity with banks to promote farmer welfare schemes including crop insurance for the new owners of the land. Surveys conducted by the Centre for the Study of Developing Societies (CSDS) in 18 states had found 14 percent farmers were landless. A government survey last year noted about 69 per cent of agricultural households across the country possess less than one hectare of land. Another 17 per cent owned between just one to two hectares. Only 0.4 per cent of agricultural households possessed 10 hectares or more.